Raced in top six in second career start at South Boston Speedway, 2004. Finished in the top four of the Most Popular Driver Standings, 2003. Second runner-up in the Most Popular Driver Standings, 2002. 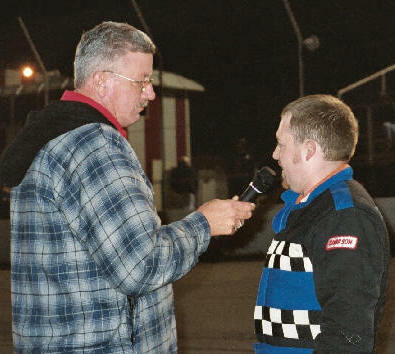 Runner-up for Late Model Stock Car Rookie of the Year, 2000. Finished in top three of points standings, 1999. Led points for over half the 1998 season. Runner-up for Limited Sportsman Rookie of the Year, 1998. Only driver to complete all laps of competition, 1998. Co-champion of Pure Stock Division, 1997. Only driver at Orange County Speedway to finish in the top 5 every race, 1997. Rookie of the Year in Pure Stock Division, 1995. Richard Petty Driving Experience Graduate at Lowe’s Motor Speedway, 1995, Phoenix International Raceway, 2004. One of top five fastest in speed out of 60 participants in the RPDE. Three wins in last four races in Go-Kart Stock Class, 1994. Go-Kart Stock Class Rookie of the Year, 1993. Car Chief / Spotter for sister’s LMSC team.